It has been clear for a while now that iOS devices are not the only Apple products to benefit from Retina displays. The Mac OS has teased us for a while with HiDPI Retina images, and the most recent is the inclusion of 2X images in Messages in Mountain Lion. If you look at the tradeoffs Apple made with the new iPad to get it to Retina quality, it is pretty clear that HiDPI will have a big influence on Macs too. Display: Obviously, an upcoming round of Macs will have super-high resolution displays. It does not necessarily mean the displays will have double the pixels from their current sizes, however. Macs are not set to certain aspect ratios (even though Apple seems to be trending towards 16:9). Moreover, the distance between a user and a computer display varies. A Mac is usually set further away than a tablet or phone, making the “Retina” less dense than the new iPad’s 264DPI. What we know from the new iPad is that upping the amount of pixels does a few things to change a machine. Obviously, the first thing is that it costs more to build a “HiDPI display.” Apple was likely able to invoke some economics of scale to bring the cost of its wildly popular iOS devices down. However, Macs sell relatively little when compared to iOS device sales, which means they will cost Apple much more to make. Additionally, as seen in the new iPad’s 70 percent bigger battery, HiDPI displays will take much more power to run. Not just battery power, but also GPU power. 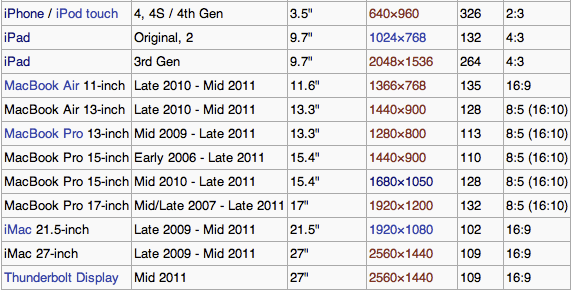 Luckily, Intel’s new Ivy Bridge chips supposedly have enough GPU power to run 4K displays on their own. Apple’s desktops will not need to worry about the electrical power needed to run these displays, but the MacBook line will need to ramp up battery requirements. Battery: Will the MacBook Air need a 70 percent bigger battery to handle the new display? Probably not, because the relatively power-hungry Intel processors take up a bigger percentage of laptop batteries—meaning the display has less impact on the total battery drain. Additionally, Intel’s Ivy Bridge and subsequent processors use less power than current processors, which will likely offset some of the extra power needed for HiDPI. Even with those stipulations above, the typical HiDPI MacBook will need a bigger battery to maintain the same amount of battery life as current models (Apple clearly prioritizes this due to the tradeoff made in the new iPad). Weight: Apple also showed it is not afraid to make things a little heavier and thicker in the new iPad to accommodate the extra battery, and perhaps some additional LEDs and thicker pixels of a Retina screen. Apple could then theoretically make a little room in the case for some more battery. With the MagSafe connector, however, Apple is not as limited by the amount of power that goes through the line and could avoid the significant time it takes to charge the iPad by upping the wattage of the power supply. The rumored merger between Pro and Air will give Apple some wiggle room in this regard. By cutting out the Optical, Apple could offset the additional battery on the MacBook Pros and then some. Heat: Will these new MacBooks run hotter? Again, the display is a smaller piece of the laptop puzzle, so the result will be muted somewhat and offset by gains in the shrinking CPU. But overall, yes it will be. RAM: The new iPad has double the RAM of the previous iPad, but the extra resources required by Retina applications absorb most of this. With the price of 8GB of RAM approaching $40 and less, it would be surprising and disappointing to see Apple continue to offer 2GB and 4GB configurations. I would expect Apple to move to 8GB and 16GB Macs. Broadcom has a new Gig Wi-Fi that could find its way into devices this year, which will challenge the speed of Gig Ethernet. Intel’s Ivy Bridge supports USB 3 devices—meaning a much faster out-of-box connector for those who cannot afford the prices of Thunderbolt peripherals. Apple is moving away from Optical across its line (latest – see: Mini), so it would not be surprising to see all but the high-end Pros move to the Air platform without optical and Ethernet. Look for Apple to release a lower price Thunderbolt dock (A Thunderbolt Display without the display) that allows more people to use legacy ports and —more importantly—allows Apple to ship a MacBook Pro without an Ethernet Port, Firewire. We have not learned enough about Apple’s upcoming Ivy Bridge MacBook refresh to know whether it will be coming this time around, but expect some big changes when it does.